Experience an Exceptional Smile with Implant Dentistry! With the technology of dental implants and tooth implants, missing teeth can now be easily, comfortably, and permanently replaced. Often, patients assume they’ll have to choose between bridges, dentures, and partials if they’re missing a tooth or teeth. But dental implants are durable, natural-looking restorations that offer an ideal alternative for many patients in Marble Falls, Brady and the Burnet area. Dental implants or tooth implants provide patients with a restoration that exactly imitates the look, feel, and function of a natural tooth. After a titanium anchor is first implanted into the jawbone, your surrounding bone tissue fuses with the post to create a solid foundation for your dental implant. Then Dr. Ritchie will attach a handcrafted, permanent crown that will blend seamlessly with your other teeth. For patients missing multiple teeth, dental implants are sometimes used to secure bridges and dentures to prevent slipping. Because the titanium post imitates the root of a natural tooth, dental implants are exceptionally durable and should last a lifetime. As mentioned, dental implants can be used in a wide variety of ways to replace teeth. 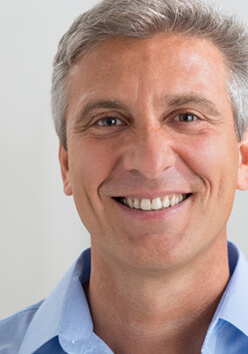 To determine which option is best for you, consider our dental implant solutions below! If you’re missing one tooth, a single implant-retained crown and titanium implant are more than sufficient to replace it and restore your smile and chewing capabilities. The crown and implant are attached together via an abutment, which acts as a screw between the two parts and helps give the crown a stable foundation. Replacing multiple teeth is done with implants much like a traditional bridge. The main difference is instead of buffing down existing teeth for the bridge to rest on, two implants anchor the restoration. Even though you’re replacing three to four teeth at a time, you only need two implants, one on either side, to reliably hold your replacement teeth. If you currently wear dentures, you’re probably familiar with the constant slipping and sliding that occurs when you wear them. Instead of purchasing another denture altogether, our dentists can customize your denture to fit with dental implants. If needed, a new denture can be created to fit with implants as well, but this depends on your current denture’s condition. With only four to six implants placed strategically throughout your jaw, you can replace an entire row of teeth and maintain a more stable restoration overall. Keep in mind that dental implants are a long-term investment thanks to their durability and longevity. While the upfront cost can be high, it’s still more cost-effective than choosing a denture and bridge only to replace them several years later.